Derailleurs displayed in The Kentucky Wheelmen booth at the 2015 Handmade Bicycle Show in Louisville. It’s a deceptively simple thing, the rear derailleur: a mechanism that moves the chain from cog to cog at the rider’s command. But it took decades after the bike boom of the 1890s to arrive at a configuration we’d recognize today. 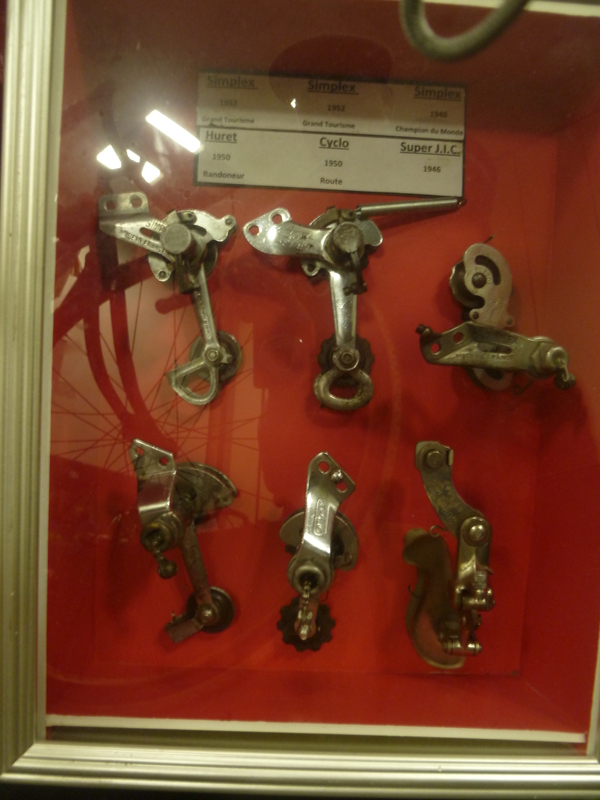 These derailleurs were built in France in the years around 1950. Five of them mount to the chain stay, forward of the freewheel, and operate without a parallelogram, the deformable rectangular structure that is today universal among mechanical derailleurs. The one in the lower right features a parallelogram and mounts to the rear dropout, close to current practice, but it sports just one, not two, jockey wheels, which Disraeli Gears contends doomed it to uselessness. Science fiction writer Arthur C. Clarke contended that any sufficiently advanced technology is indistinguishable from magic. But once that technology ages, particularly when you’re dealing with the relatively transparent technology of a bicycle, the magic fades and disappears. Today’s gear shifters work much better than these old French devices, but we expect precision. And precision is not the realm of the indefinable, the ineffable or the mysterious. I’ve been told the speed and accuracy of Shimano’s Di2 derailleurs make them magical things. And they may be, to the extent that tight tolerances, electricity and hidden motors are magical. But these old derailleurs (and earlier, three-speed hubs and Campy’s Cambio Corsa) were closer to the wizard’s wand. Change gears on the go. Adapt your strength to the irregularities of the Earth itself. No stopping to move a chain by hand from one cog to another. No electricity. No motors. Just your desire and intent to change. All you’re changing is gears, of course, but if you can change gears on a bicycle, what else might you be able to change, accept, improve or discover? What magic might you find at the end of a derailleur cable? This entry was posted in Equipment and tagged derailleur, Handmade Bicycle Show, Louisville, The Kentucky Wheelmen. Bookmark the permalink.